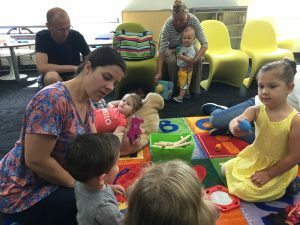 This informal playtime for babies and toddlers invites families to practice sharing, enjoy a song and “just right” story, and play with developmental appropriate toys in the blue activity room. The room is open between 9:45-10:30 and our opening song starts at 10 a.m. Please register for this free program at the youth desk at 641-754-5738, ext. 3 or email Joa at mtownlibrary@yahoo.com with your child(ren)’s name & age. This program is free, and geared for little ones 0-30 months, with a caregiver.